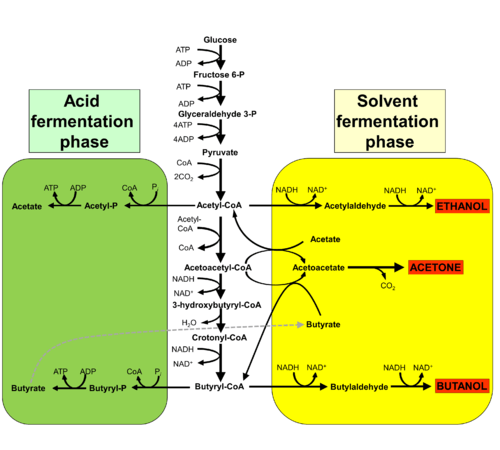 This figure shows pathway of acetone–butanol–ethanol fermentation by clostridia. Acetone–butanol–ethanol (ABE) fermentation is a process that uses bacterial fermentation to produce acetone, n-Butanol, and ethanol from carbohydrates such as starch and glucose. It was developed by the chemist Chaim Weizmann and was the primary process used to make acetone during World War I, such as to produce cordite, a substance essential for the British war industry. The process may be likened to how yeast ferments sugars to produce ethanol for wine, beer, or fuel, but the organisms that carry out the ABE fermentation are strictly anaerobic (obligate anaerobes). The ABE fermentation produces solvents in a ratio of 3 parts acetone, 6 parts butanol to 1 part ethanol. It usually uses a strain of bacteria from the Class Clostridia (Family Clostridiaceae). Clostridium acetobutylicum is the most well-studied and widely used species, although Clostridium beijerinckii has also been used with good results. For gas stripping, the most common gases used are the off-gases from the fermentation itself, a mixture of carbon dioxide and hydrogen gas. The production of butanol by biological means was first performed by Louis Pasteur in 1861. In 1905, Austrian biochemist Franz Schardinger found that acetone could similarly be produced. In 1910 Auguste Fernbach (1860-1939) developed a bacterial fermentation process using potato starch as a feedstock in the production of butanol. Industrial exploitation of ABE fermentation started in 1916, during World War I, with Chaim Weizmann's isolation of Clostridium acetobutylicum, as described in U.S. patent 1315585. The Weizmann process was operated by Commercial Solvents Corporation from about 1920 to 1964 with plants in the US (Terre Haute, IN, and Peoria, IL), and Liverpool, England. The Peoria plant was the largest of the three; it used molasses as feedstock and had 96 50,000-gallon fermenters. After World War II, ABE fermentation became generally non-profitable, compared to the production of the same three solvents (acetone, butanol, ethanol) from petroleum. During the 1950s and 1960s, ABE fermentation was replaced by petroleum chemical plants. Due to different raw material costs, ABE fermentation was viable in South Africa until the early 1980s, with the last plant closing in 1983. Currently there are no operating ABE plants. In order to make ABE fermentation profitable, many in-situ product recovery systems have been developed. These include gas stripping, pervaporation, membrane extraction, adsorption, and reverse osmosis. However, at this time none of them have been implemented at an industrial scale. ABE fermentation is attracting renewed interest with an eye on butanol as a renewable biofuel. 1 2 Mark R. Wilkins and Hasan Atiye (2012). "Fermentation". In Nurhan Turgut Dunford. Food and Industrial Bioproducts and Bioprocessing. Wiley. p. 195. ISBN 9781119946052. ↑ Qureshi N, Blaschek, HP. 2001. Recent advances in ABE fermentation: hyper-butanol producing Clostridium beijerinckii BA101. J Ind Microbiol Biotechnol 27(5):287-291.